The typical dutch product is leading in our lunchroom. Our special item is our homemade Dutch speciality the “stroopwafel” or syrup waffle! Right at the entrance of the store we make the warm waffles for the lunchroom and take-away. Another item that we can’t without is the typical Dutch pancake! We have a variety of delicious pancakes, from sweet to savoury. Perfect for your lunch stop in our cosy restaurant. The furnishings and decor are contemporary but with a clear dutch look. This is in harmony with the cheese shop in the front part of the building. To complete the setting our staff is dressed in the famous and well-known Dutch costume! 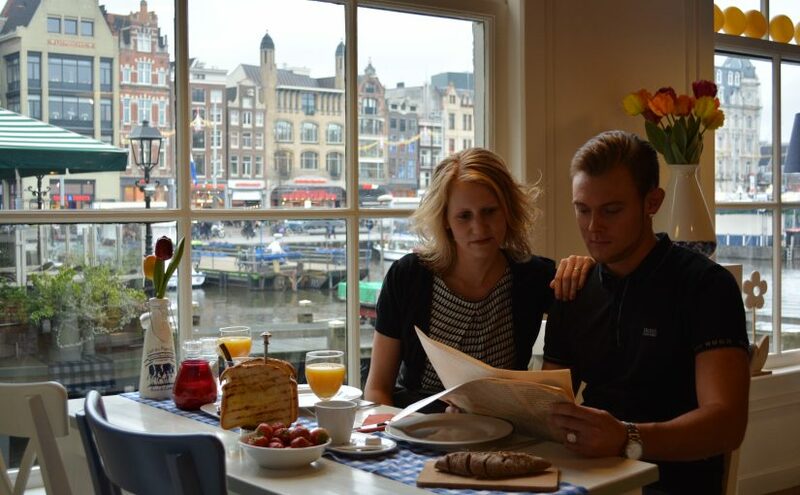 This in combination with the cheese store, the atmosphere and the view over the familiar Amsterdam buildings, make the lunchroom to a typical Dutch experience which is highly appreciated by our guests. We serve a fresh cup of coffee, espresso, cappuccino or latte macchiato with real dutch apple pie, chocolate pie or cheesecake baked by one of the finest bakery’s in Amsterdam.